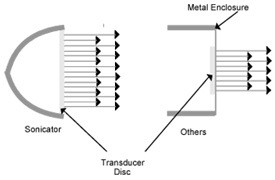 In 1957 Mettler Electronics Corp. revolutionized the therapeutic ultrasound industry with the Sonicator®. Portable and lightweight, it was the first of its kind. 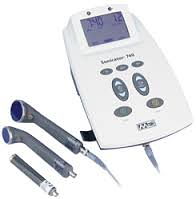 Still today, the Sonicator is the standard in therapeutic ultrasound devices. 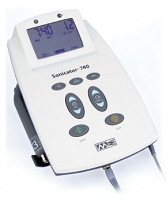 All Sonicator devices feature detachable applicator cables, continuous and pulsed modes, built-in applicator cradles and a two-year limited warranty, one-year on applicators and cable. Mettler Ultrasound applicators can be changed quickly and easily using Mettler’s unique universal applicator cable. Instead of having multiple attached cables, there is only one. The cable can be changed out if damaged without needing to send the entire applicator assembly in for repair, saving time and money. Arrows indicate the relative depth of ultrasound penetration between 1 MHz and 3.3 MHz frequencies. 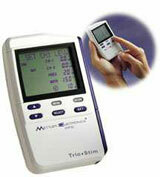 Revolutionary New Hand-Held Ultrasound Mettler Electronics’ newest therapeutic ultrasound is the Sonicator 718. 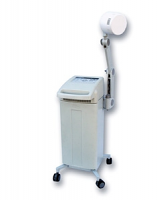 The Sonicator 740 is 1 and 3 MHz therapeutic ultrasound unit that comes with a 5 cm_ dual frequency applicator. It is light-weight and portable and features a universal applicator cable to make changing applicators quick and easy. The Mettler Sonicator 740x has all the features of the Sonicator 740 but comes standard with all three available applicators—a 5 cm2 dual frequency applicator, a 10 cm2 / 1 MHz applicator and a 1 cm2 / 3.3 MHz applicator. All three applicators can be stored on the unit itself to keep them available at all times.